Info "Drink it all! Every drop!" Crazy Straw is one of Kat and Ana's microgames in WarioWare: Twisted! The game's theme (the person, color etc.) is very similar to the microgame Mooo-ve It!, and the WarioWare: Touched! microgame, Cup Runneth Over, but it doesn't have the same gameplay. 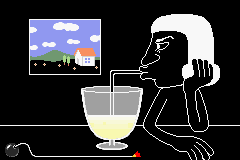 The game's purpose is to finish all the drink found in the glass. To do so, the player needs to press the button repeatedly. If done so, the game is won. However, if time runs out and the glass is not empty, the player loses. 1st level difficulty: The glass is full and small. 2nd level difficulty: The glass is full and large. 3rd level difficulty: The glass is large and almost empty, but a waiter refills it. While the North American version of this microgame, as well as Mooo-ve It!, has a daytime farm setting on the window, the Japanese version has a nighttime big city setting. The microgame Cup Runneth Over from WarioWare Touched! keeps the Japanese version's setting in both releases. This page was last edited on October 29, 2018, at 21:27.